The Codex Trivulzianus is amongst Leonardo’s earliest known manuscripts. 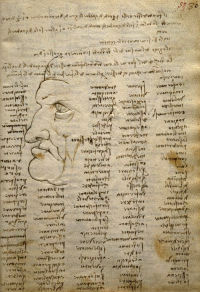 Many pages take the form of word lists, illustrating Leonardo’s interest in Italian language and literature, and in Latin. In addition, there are architectural drawings relating to plans for a crossing-dome for Milan Cathedral, and a curious gallery of real and imaginary portraits.